DETROIT (FinalCall.com) – During a two-day visit to Detroit which included messages to the city’s political and spiritual leadership, the Honorable Minister Louis Farrakhan offered a vision of unity, cooperation and productivity that could turn the city around. “I want to hurriedly say to all of you, don’t despair for the darkest hour is just before the dawn,” Minister Farrakhan said May 17 during remarks to the Detroit City Council, one of the stops during his visit. Though the city is presently viewed as an example of urban blight and economic decay, the residents of what was famously called “The Motor City” have an opportunity to change the city’s conditions and to serve as an example of urban renewal to be emulated across the country. This once proud city is only a shell of its former self with Black and White residents fleeing, abandoned and burned-out properties on major swaths of land, and in many vacant lots throughout the city, trash is stacked up high as if they were landfills. Dorthea E. Thomas, 22, and a global missionary with the United Methodist Women shared the same sentiments and said the Minister’s message “touched her heart.” She is also a candidate for the Detroit City Council. In fact, she’s the youngest on the ballot. “I think this message really hit home because one of the problems that we have in Detroit is we don’t have unity in our communities. 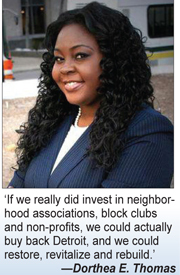 If we really did invest in neighborhood associations, block clubs and non-profits, we could actually buy back Detroit, and we could restore, revitalize and rebuild. But a lot of people have really lost faith because many of the issues that happened in our past, because of what’s going on right now, a lot of people can’t see a better future for Detroit,” said Ms. Thomas. On the morning of May 17, Minister Farrakhan entered the Coleman A. Young Municipal Center and after being introduced by Detroit City Council president Charles Pugh delivered a moving message touching upon the central role, and storied history of the city in the history of the Nation of Islam. (L) Minister Farrakhan receives a proclamation from the Detroit City Council. (R) Members of the Detroit City Council listen to the Minister as he called on political leaders to work for the people. “So the message of the Nation of Islam started narrowly in Detroit, but by the grace of Allah that light is shining back toward the east and we are honored to be back where it all began. But we come back at a time of intense darkness. We come back at a time when there’s great despair among the inhabitants of the city of Detroit,” said the Minister. At a time when schools are closing, areas of the city look abandoned, crime and violence appear to be running rampant. The Minster also said to those seeking political office, to maintain high standards and morals not ruling in corruption, not ruling in vanity, but establishing rule using righteous principles, “Then the city will live again,” he said. While stopping short of criticizing the newly appointed emergency manager, Kevyn Orr, the Minister was critical of the state’s leadership who appointed him and other emergency managers across the state of Michigan. “I don’t know what democracy really means if you can be given the right to vote and then somebody can take it away and make your vote null and void, create circumstances of debt that you might not be able to pay under present conditions,” said the Minister. “But wherever there’s a carcass, there’s always a buzzard somewhere,” he added. The land speculators, whom the Minister described as “vultures” are now flying around Detroit amidst the deteriorating buildings in many of the city’s neighborhoods, buying property for cheap prices. The area Downtown is looking good and being revitalized, but many parts of the city and its outlining areas resemble wasteland, he said. Although the situation at present looks bleak, the circumstances could produce an opprtunity for triumph. “Wastelands always give opportunities to those who have a vision,” said the Minister. “While the buzzards want to eat up the carrion, and that which is dead maybe deserves to be eaten, there are those who want to see this city come back to life. Now those, who are the real stakeholders in Detroit,” he added. Many councilmembers, as well as the nearly 300 who filled the council chambers cheered. In a brief meeting prior to the Minister’s 30-minute message before the council, Detroit city councilmember JoAnn Watson painted a picture of a city and a people under siege. The Minister also met with Detroit Mayor Dave Bing, who recently announced that he would not seek a second term. Later that evening, lines of men and women stretched around the sprawling property of Fellowship Chapel led by Rev. Wendell Anthony, also head of Detroit’s NAACP. Concerned Detroit residents eager to hear the words of guidance coming from Min. Farrakhan, filled the main auditorium of the church as well as an overflow area in what is called the Village Dome. According to church officials and organizers for the event, the standing room only crowd in the main auditorium and the overflow room brought attendance totals over 3,000 with many still unable to get in. The Minister set the tone for the evening leading by asking if the money being raised during the charity portion of the event could be given to Muhammad Mosque No. 1 to invest and build. The crowd overwhelmingly agreed. Knowing that he was in a church and the majority of those in attendance were Christians, Min. Farrakhan talked about the people and their love of Jesus.“I know you love Jesus, but I don’t know if you know him as much as you love him,” said the Minister. “Singing about Jesus is a good thing. Praising Jesus is better, but following Jesus is best of all,” he added. There are too many crosses being worn, but not enough people living and working according to the principles he espoused.“You’ve got the name of Jesus but you don’t have the spirit of Jesus otherwise, if you had his spirit, the work would be done!” he said.“Jesus was hated by the same forces that have killed this city,” said Min. Farrakhan. Those who are presently ruling society, which he called “scientists of evil,” have set up a world contrary to God’s will. They make evil fair seeming, and make the servants of God afraid to preach the word. They promote filth and indecency, as well as unhealthy foods that have an easily observable negative effect on the body. Jesus was the last hope for the Jewish people, but they rejected him. They are now in control of the media and the airwaves, gaining access to the “sacred territory” which is the minds of the people.“They have mastered the civilization now, but they’ve mastered it in evil,” he said. “Satan has devoured much of humanity,” he added. He said one cannot claim to be a follower of any of the prophets if they remain “silent when injustice rears its head.” The people must be willing to be courageous enough to stand up, and not leave a “legacy of cowardice” for future generations. Moreover, as it relates to spiritual leaders he said they should be strong enough to preach the full Gospel, and not be enticed by political power, nor corrupted by the influence of such associations. Posted on May 22, 2013 January 3, 2015 by missdortheaenriquePosted in AllTagged community, Detroit, Dorthea Thomas, faith based, Leadership.